Our three balloon table decorations are only £4.99. 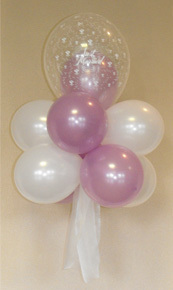 Our five balloon table decorations are only £6.49. Our single cloud clusters are only £13.49. If you would like three cloud clusters linked together by ribbon behind your top table then they cost £37.99. Our 6ft entrance columns are £40 each. Our single pearl arches are £39.99 and our spiral arches are £125. 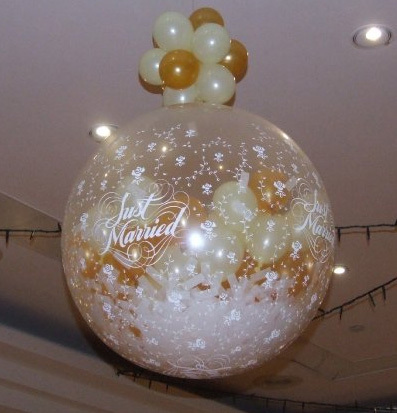 Exploding balloons are a great addition to your wedding balloons and create a moment in your special day that you’ll never forget. 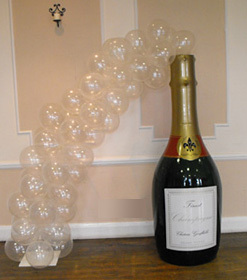 Why not open the dance floor to your guests by bursting the balloon together. Our exploding balloons are £49.99. Our double bubble balloons will make your wedding balloons look extra special. Our three balloon double bubble table decorations are only £9.99 and offer excellent value for money. 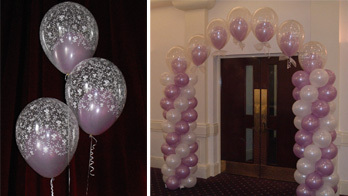 Our double bubble balloons can also be used to create an arch between two of our 6ft balloon columns to create an eye catching entrance display. One of our more popular displays and one guaranteed to impress your guests. This display is competitively priced at £39.99. This is just a small selection of the displays that we have to offer so please see in store for more details.